Supporters say the Hubble telescope has expanded the understanding of the cosmos. (SPACE.com ) -- A fresh salvo was fired Tuesday in the fight to save the Hubble Space Telescope. Maryland Sen. Barbara Mikulski accused NASA Administrator Sean O'Keefe of making a unilateral decision to let the observatory die prematurely against the wishes of astronomers. "I believe that the future of Hubble should not be [decided] by one man in a NASA back room without a transparent process," Mikulski said, adding that she will continue working to bring the "best advice possible" to bear on possibly reversing the decision. Scientists and officials here at the Space Telescope Science Institute (STScI), which operates Hubble for NASA, applauded Mikulski for her support, yet some figure it could take a miracle for Hubble to receive a stay of execution. Still, they have not lost hope. Meanwhile, Hubble made its own case Tuesday for its unsurpassed ability exploring the universe. STScI Director Stephen Beckwith unveiled the deepest photographs ever taken of the cosmos, the results of the Hubble Ultra-Deep Field. Researchers said the images likely contain the most distant galaxies ever recorded, and clearly visible are a host of baby galaxies in odd shapes and strange contortions that astronomers around the world are racing to comprehend. Unlike many scientific results, which are hoarded while a handful of deeply involved scientists scrutinize them for well-deserved rights to first publication, Beckwith released the data to all scientists at once, and essentially told them to have a ball. At Beckwith's side was Sen. Mikulski, who sent a letter in January 21 asking O'Keefe to reconsider his January 16 decision not to conduct Servicing Mission 4, which in 2006 would have extended Hubble's life to the end of the decade and even improved its capabilities. Instead, with batteries dwindling and gyroscopes failing, Hubble could be rendered useless as early as this year or, more likely, sometime in 2007. "I think its just amazing," Mikulski said of the new photograph, which contains about 10,000 galaxies, a handful of which probably date back to when the universe was a mere 300 million to 500 million years old. "It's also a salute to a democratic society," she said of the data's public release. More important, Mikulski re-affirmed her commitment to fight for Hubble. "This is why I will continue to stand up for Hubble," she said. Among astronomers' concerns has been that O'Keefe made his decision to cancel the servicing mission without taking the pulse of the astronomical community. Though O'Keefe said the decision was based solely on astronaut safety, astronomers have suspected that Hubble is instead the first casualty of President Bush's announced vision to reinvigorate human spaceflight, and that the endeavor to put humans back on the Moon will come at the expense of telescopic science. O'Keefe has not budged on his intent but he did ask Adm. Hal Gehman, chairman of the board that investigated the Columbia shuttle breakup last year, to "review the [Hubble] matter and offer his unique perspective." Gehman is expected to report back any day now. Mikulski is the ranking Democrat on the Senate subcommittee that oversees NASA's budget. She had previously said she would accept Gehman's recommendation. She changed that stance Tuesday. "I won't stop there," Mikulski said of the second opinion due from Gehman. "I will continue to pursue getting the best advice possible." Beckwith was pleasantly surprised at Mikulski's renewed determination. "All of us were tremendously encouraged, because this is a big shift in the direction of, 'I don't care what Gehman says,'" he said of Mikulski's comments. Beckwith is also amazed at the public support shown for Hubble and the fact that reporters keep writing news articles and editorials about the observatory's planned demise "many, many news cycles" into the situation. And he's encouraged by a bill introduced into the U.S. House of Representatives last week, by Rep. Mark Udall (D-Colorado), urging NASA to establish an independent panel of experts to review the Hubble decision. "Things are going our way right now," Beckwith said. "A lot of people at this institution still think a miracle could happen." He is realistic, however, knowing that the decision rests with NASA. His team is busy planning how to maximize Hubble's observations on the assumption that it has just 2 to 4 years left. They are also working on ways to extend battery life and operate on two gyroscopes instead of three, in an effort to insure Hubble's productivity into at least 2007. 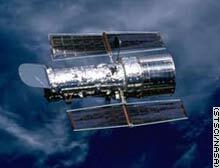 Hubble is armed with six gyroscopes, and several have been replaced already. Only four are working now. Three are needed, though engineers are scrambling to devise a scheme to point the telescope with just two gyroscopes. Battery life is more of an unknown. The onboard batteries, charged by solar panels, are showing signs of wear. They could last for 3 or 4 years, or they could fail this year, Beckwith said. If the batteries fail, he said it's possible the telescope could go into an uncontrolled spin. That would make it difficult if not impossible to attached a robot of some sort to the observatory -- NASA's current plan -- to deorbit it safely into the ocean by about 2013. Hubble is too large and potentially dangerous to allow it to fall to Earth on its own, which is what would eventually happen. Beckwith stressed, though, that scientists are working on ways to keep the telescope under control even if the batteries dwindle beyond the point of supporting useful science, and that engineers have not yet figured out what would actually happen when the batteries fail. "I think it's just too early to know," he said. But he added: "Within the project, all of us who know this telescope are scared to death that it will wind up in a tumbling state that would be exceedingly challenging to retrieve under any circumstances." He recalls that batteries and gyroscopes were not swapped out during the last servicing mission, in 2002, because planners assumed there would be one more chance to lift Hubble's hood. "These sorts of results show how spectacular and unique Hubble is," Garth Illingworth, an astronomer at the University of California, Santa Cruz, said in an interview. In fact, the photograph was made possible only because astronauts journeyed to the observatory in 2002, repairing its infrared camera and affixing a new visible-light camera, Illingworth points out. The two instruments were combined for to make images of the identical space in the new project. "They made Hubble way better than it's ever been," he said of the astronauts. "It's a whole new spacecraft. That's what these servicing missions are about." A planned upgrade to Hubble's infrared camera would be 10 times more powerful than the current one, and the instrument is already built. If the servicing mission could somehow be resurrected, as Illingworth and other astronomers hope, the new infrared capability would allow researchers to re-survey the Ultra Deep Field to characterize the distant galaxies. Instead of just knowing how big they are, astronomers could learn what they're made of. The new camera would also allow a broader look at the very distant universe, through additional surveys, helping theorists better understand how those early galaxies formed and evolved. "Suddenly whole new programs open up, things you can do that you could never do before," Illingworth said. He hopes a way can be found to undo O'Keefe's decision and service the Hubble. "It'd be great scientifically, it'd be great for the nation, for educators, for students, and it'd be just great for the public at large, because Hubble is so exciting for people."